Death of Adam by Piero della Francesca. Her absence is the presence of loss. Everything in his life is impacted by the loss. Though he keeps reassuring that everything is just fine…most of the time. As I think about the Lenten journey, this phrase “most of the time” is ringing in my ears. I can say, “I’m happy go lucky…most of the time.” “I’m actually doing pretty good…most of the time.” It shines light into something that is often hidden…our sense of brokenness. Our desperate need of redemption. Most of the songs on Dylan’s album Oh Mercy, are peeling back the veneer our lives and reminding us that something is desperately wrong. He looks at the world around us and exposes the harsh cruelties that begin in lost love and ripple outward to a cold and harsh culture. The world is broken under the weight of sin, under the grief of death. At times, we may feel this grieving, this groaning deep inside us and cry out with wordless prayers of anguish. But “most of the time” we’re clear focused all around. Most of the time we can keep both feet on the ground. During Lent, we pause, acknowledge afresh that “most of the time” we cloak our need for mercy. While our faith is always centered in the cross, during Lent, we turn afresh to the cross of Christ, asking the Spirit of God to search us, heal us, and lead us in the way of our Savior. The discipline of self-examine shows up across most of the Christian traditions. One term for parish priest was curate, which literally means one who is invested with the care or cure of souls. From the Puritans to the Eastern Orthodox, cure of souls has often been at the heart of ministry. Even the word Psychotherapy might be properly understood as the healing of the psyche (the spirit of the person). Typically when I take time for self-examination and prayer, I may pause, ask God to search my heart, and pray whatever comes to mind. Oddly, it is often difficult to see my own heart. I may list areas I need to improve and ask God for grace and mercy. Then a few days later, the simplest things offend me. “Why was I excluded from that group?” “Why did that person just step in front of me. Didn’t they see me standing here?” “I can’t believe people are praising him so much for what he just said. I was talking about that 20 years ago and no one praised me!” Then suddenly it occurs to me. Oh my. The Spirit is examining my heart and revealing my absolute selfishness, revealing my illusion that the world must revolve around me. The Spirit of God is peeling back the layers of my geniality and revealing a heart that needs forgiveness and healing. Sin infects like a hidden disease, corrupting, blinding, crippling. I must run afresh to the throne of mercy and grace. 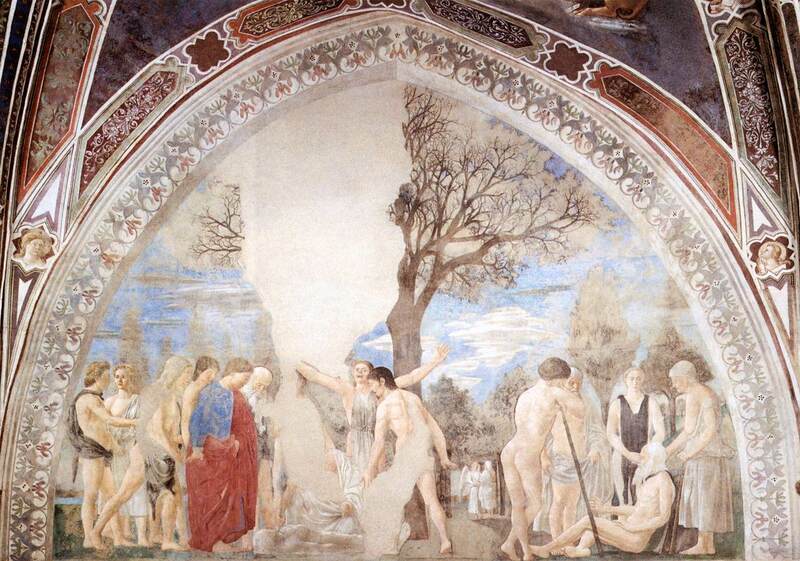 In today’s readings we are faced with two temptations: Adam and Eve in the garden. Jesus in the wilderness. They face the tempter, the Satan. In the moment of temptation, Adam and Eve turn away from God. Leave the garden and enter into the wilderness. Jesus turns to the Father, resists the death, and begins the path of transforming the wilderness back into a garden. In the passage we read from Romans, Paul is reflecting upon our redemption in light of these two stories. There are three pairs of ideas discussed: sin and death, law and transgression, grace and life. “Therefore, just as sin came into the world through one man, and death through sin, and so death spread to all men because all sinned” (Ro 5:12). Adam sinned. Sin leads to death. All have sinned. All face the sting of death. In turning away from the Father and disobeying His command, Adam and Eve impacted all creation. Their actions rippled through the cosmos like a stone on a water. We are born into a world where the impact of sin, of disobeying God, of turning away from the Father, ripples through everything. His children cannot understand their father’s implacable gaze. Against the silence of a face turned away. We are born into a world where the very ache of death still trembles in the ground. Unimaginable. Unimaginable. Each generation continues to live in the pattern of sin and death, and continues to throw stones upon the water of the world. The sin of each generation ripples out with the consequences of suffering and pain and grief and isolation. We were made for the bliss of loving communion, but so often we no the ache of loneliness and division and isolation. Paul continues in Romans 5:13 by saying, “for sin indeed was in the world before the law was given, but sin is not counted where there is no law” (Romans 5:13). It may appear that he is placing fault with the law because later he will say, “the law came in to increase the trespass” (Romans 5:20) and in other places, it will sound almost like the law is to blame for our sin. But that is not what Paul is arguing. He is helping us see that before the law that came with Moses, man still sinned and man still died. All the world lived under the curse of sin and death. But humanity was blind to the order of God and the offense against God’s order. This offense, this sin was a relational break with God, with one another and even with creation, thus it led to death. The law opened our eyes to the order of God and our offense against that order. With the giving of the law, we could speak of sin and transgression. We violated God’s perfect order and broke the relation of love with the cosmos. The little act of disobedience, of eating the forbidden fruit seems almost insignificant and yet it impacted all things. Our little acts of anger, lust, dishonoring parents, unfaithfulness, false witness, coveting don’t only impact us. They impact our relation to God, to family and to creation. We continue to live in way of transgression against God’s order, the way of death and pain, we continue to perpetuate the brokenness at the heart of the world. When Jesus comes he recapitulates the story of Adam and the story of Israel. In other words, He is the long-awaited king born into the story in the house of David. He fulfills the history of Israel, but He not only fulfills it, He re-enacts it. He re-enters into the story of the temptation of Adam and He overcomes the tempter. The whole history of Israel and actually the whole history of the world is now re-oriented in Jesus. First, He breaks the power of sin and death by bearing the judgment, the disordering in himself. Then He reorders it. He reorders us. As Paul says, we are no longer considered transgressors of the law, but we have been justified in Christ Jesus. We are brought back into proper relation with God, with others and with creation. He does more than bear the penalty of sin and death. He does more than bring forgiveness for sin. He leads and is leading all creation to His fullness, to His glory. Think of it like this. When Israel is given the law, they see a glimpse of God’s order for their community. For their little part of the world. They also see how this has universal implications. They see glimpses of the mystery of the universe (stars singing in Job, Sun, moon and stars ruling in Genesis, life poured out in sacrifice in Exodus, but they simply don’t have all the parts to see the full picture. The Law points to an underlying order and some potential aspects of the picture. They can see how they have violated they particular parts of the over all picture (transgression). But they cannot see the bigger picture. When Jesus comes He fulfills the underlying order in the world and He makes a way for His people and His creation to grow up into perfection, into a glory that no one in ancient Israel could have ever imagined. The Garden of Eden will become a city of gold surrounded by trees that produce fruit all year round. The glory of Christ shining out in creation will be so bright that we won’t even need sun, moon or stars for light. It is a glory of perfect love, perfect communion. Thus Paul can speak of the “much more” of grace and life in Christ. He brings much more than simply forgiveness, He brings the hope of glory in Himself and shining out in HIs people. During Lent, we fix our eyes on Jesus. We ask him to reveal those places where sin has bound us, limited our capacity for love, separated us from Him and from those we love as well as those we don’t love. We want to enter into the way of the cross, know His death, and walk more fully into the freedom of His life and love. “The Mouth of Grief” by Robert Cording in Heavy Grace. Alice James Books (April 1, 1996).